Dylan Brown swinging during his trip to South America. For more than 1,300 graduates, the thought of ‌settling into a cubicle in a corner after crossing ‌the commencement stage was just not satisfying. ‌They instead chose to move thousands of miles from home, finding work and building a life in a foreign land that soon felt like home. Redbirds can be found from Africa to Asia, in South America and across Europe. They teach, coach, and help build communities. Not all left right after graduation, as some opted for encore careers after retirement. Lawrence Whittet ’78, for example, joined a team working in Dubai to build the world’s largest solar plant after a 40-year career in power construction in the U.S.
Other Redbirds are translating law in Spain, performing with the circus in Chile, teaching English in Venezuela and Mongolia, and building a school in Uganda. The international path they have chosen empowers them to learn as much about themselves as their adopted culture and its people. They know what it means to get beyond their comfort zone as they are ready and willing to say yes when invited to try duck intestines, do the Flamenco, or visit the demilitarized zone in South Korea. While such adventures are unique to each person’s story, there is a consistent message from each individual who has chosen an international life experience: There is nothing like it to build bravery and teach self-reliance. 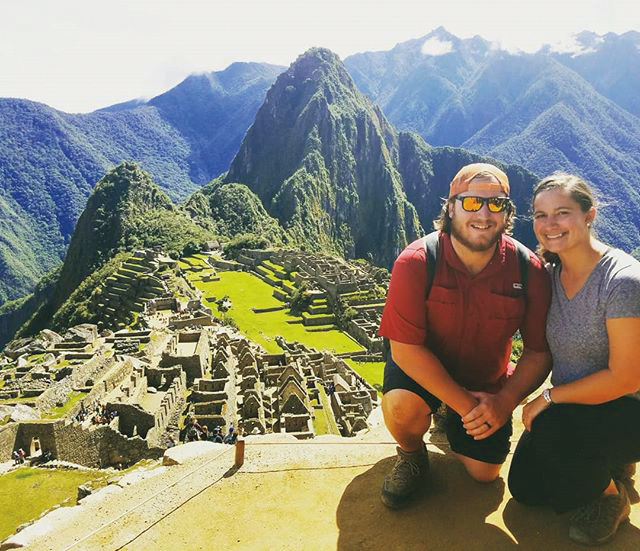 Dylan and Kelli Brown left their jobs last February for a year-long backpacking trip in South America. They climbed the 1,700 steps to Machu Picchu, biked along a sea wall in the Galapagos Islands and drove on the Salt Flats in Bolivia. The perfect time is never. 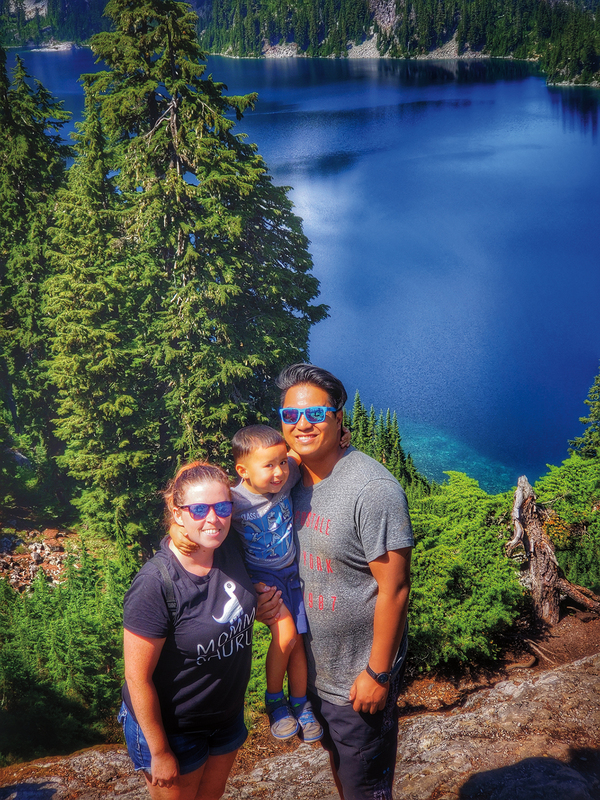 That’s what Dylan Brown ’12 and his spouse, Kelli, thought when they quit their well-paying jobs with 401(k)s and company cars to go backpacking in South America for a year. They left for Cartagena, Columbia, in February. Since then they’ve climbed 1,700 steps to Machu Picchu, hiked 30 miles to see a 1,200-year-old ancient city, and volunteered with homeless families. A couple of times they questioned their choices—like when “canyoning” in Ecuador, which included rappelling through steep canyons and jumping off waterfalls and cliffs. They chose South America because they hadn’t been there, wanted to learn Spanish, and it was both backpacker friendly and easier on the budget. They repaid student loans and saved $30,000 to trek the fourth-largest continent. They’re detailing their adventures online at revivemyreality.com. They started researching a year before departing. They made a detailed to-do list that included making a will and checking credit card expiration dates. Their 35-pound bags were packed with travel pillows, spices, and an anti-theft purse. South America has an efficient bus system, which is how they usually travel. It can take 10 to 30 hours to reach their next location. By traveling overnight, they save a night’s lodging. Sometimes they fly, as they did between Colombia and Ecuador, to avoid long delays at the border with Venezuelan refugees. They do humanitarian work along the way, which reduces lodging costs. They also created an online business, revivemyresume.com. 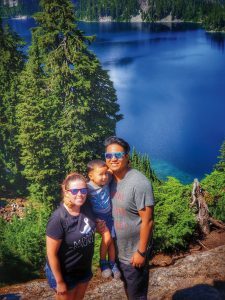 One of their goals is to inspire others on the road and when they return to the Midwest, yet they have no solid plans for life back in America. “We’re going to see what’s out there and where life takes us,” Dylan said. Gamma Phi Circus alums Emille and Sarah Morales are on tour and have lived in Brazil, Argentina and Chile this year, relocating every six to eight weeks with their 3-year-old son, Kian. Gamma Phi Circus alums Emille ’08 and Sarah (Smith) Morales ’07 were Las Vegas Cirque du Soleil performers working opposite schedules with little time to spend together with their son, Kian. They decided to join the international touring show Amaluna, and spent 2017 moving around Europe. This year, they’ve lived in Brazil, Argentina and Chile, relocating every six to eight weeks. Their lives are packed in 12 suitcases. Each time they move, they’re picked up at the airport and dropped off in a foreign city. They tackle the transportation system, currency and exchange rates, grocery shopping and communication obstacles. When in countries where English isn’t spoken, they play charades. Three-year-old Kian travels like a seasoned pro. He is absorbing cultures and languages. Able to say ‘thank you’ in seven languages, he “thinks it’s perfectly normal that one of his friends speaks Russian and another prefers French,” Sarah said. Home is usually a hotel, sometimes a small furnished apartment. Because their travels take them to all types of climates, the family packs everything from flip flops to winter coats. They have relaxed on private beaches in Brazil, in Italian villas overlooking Mt. Vesuvius and the Mediterranean Sea, and hiked through the Amazon jungle. Carrie Ward has taught all over the world the past 21 years but her current assignment, in Venezuela, is the toughest, even though she lives on the ocean. 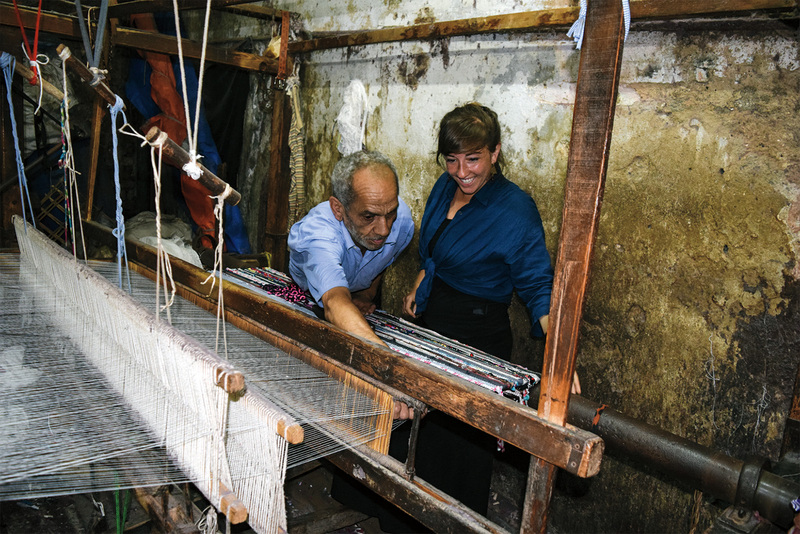 Over the past 21 years, Carrie Ward ’93 has taught in Egypt, Ethiopia, Tanzania, Hong Kong, Bangladesh and Jordan. She’s in her third year teaching second grade at a private international school in Barcelona, Venezuela. For the first decade, her mother told her what she was doing was nice, but asked when she was moving home. “She doesn’t ask anymore,” Ward said, laughing. Now her parents ask where their next vacation will be. Of all the places she’s lived, Venezuela is the most challenging—especially since she’s not proficient in Spanish. Separated from home by thousands of miles can be difficult when you need to be with family, she added. Ward was in Bangladesh when her grandfather died, and it was impossible to attend his funeral. She was in Curacaos when she got the call that her mother was diagnosed with breast cancer. While visiting with her parents in the Chicago suburbs over the summer, she realized how much her definition of home has broadened. She has a goal of visiting 50 countries by the time she turns 50 in 2020. Since she already has 47, she believes she’ll make it. Of all the places she’s been, Tanzania has a hold on her heart. Janae Stork spent three years teaching in Haiti, and learned how to handle cold showers, spotty electricity and tarantulas. She also learned how family extends beyond blood relatives. 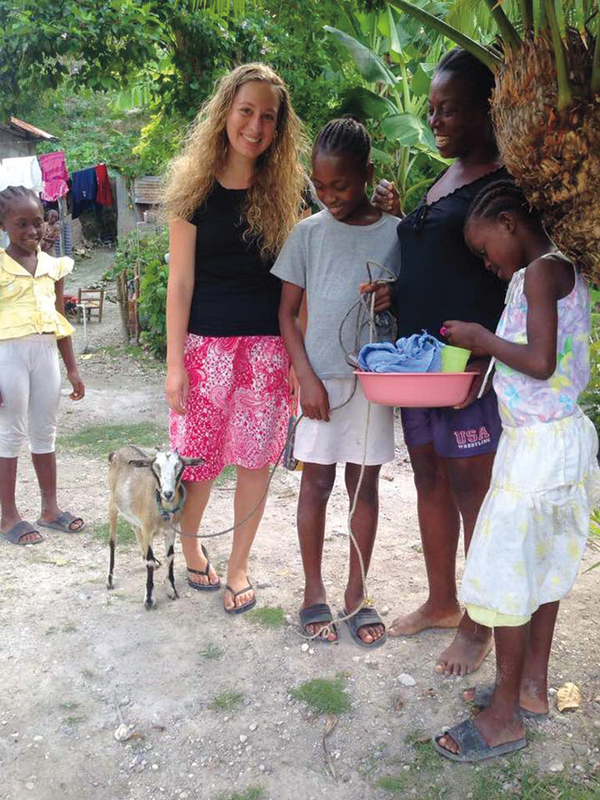 Janae Stork ’09 went to Haiti on a week-long work trip in 2015. After falling in love with the culture and the people, she planned a three-year adventure in the Third World country. For most of that time, she taught English through Reciprocal Ministries International. “The most difficult thing with my move was leaving friends and relatives, but I found family extends beyond bloodlines and borders,” said Stork, who had many initial struggles. One was learning to live without transportation. Other hardships that never crossed Stork’s mind became the toughest adjustments. “I didn’t know how I’d ever get used to cold showers or not having electricity 24/7. Both eventually became a normal part of life,” said Stork, who also struggled with the country’s creatures. It was frightening to be in the country when Hurricane Matthew hit. Stork went days before learning her 13 students had survived. They were among many who helped her embrace cultural expectations, from bartering with vendors to picking appropriate funeral attire. “My ‘little brother’ Jephthe became my cultural guide, translator, driver, and dear friend,” Stork said. She also developed a close relationship with Mavia, a local lady Stork employed. “Mavia did market shopping on Tuesdays, made lunch two days a week, and cleaned. She became one of my biggest comforts, although we didn’t understand each other’s language well,” said Stork, despite her use of a Creole/English dictionary. Home again since June, Stork is planning a wedding with a New Jersey missionary worker she met in Haiti. “I transition back to the states grateful for all my students, roommate, and Haitian friends who taught me about life in the struggling country,” she said. 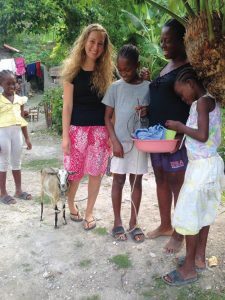 Those relationships and her life experiences guarantee Stork will forever consider Haiti her second home. Kristen Gianaris had never been further than Wisconsin when she flew to Switzerland to volunteer after her freshman year at ISU. Since then she’s lived in Taiwan, Egypt and China. Wisconsin was the only border Kristen Gianaris ’13 crossed until after her freshman year. She noticed a flyer for Volunteers for Peace in the Bone Student Center, and signed up to work on a Switzerland farm that summer. “Not only was this my first time on a plane, it was my first time to use public transportation, my first time to read a map and see the ocean,” Gianaris said. With little money and a bit naïve, she stayed in a housing co-op a few days, leaving with a list of people who could potentially host her a few nights. She carried that paper as she moved throughout Switzerland, making random calls and hoping for a couch to sleep on. “The kindness of strangers, the sense of community, and the adventure that I found inspired me,” said Gianaris, who was eager to travel more. At home just a couple weeks, she moved to Taiwan for her sophomore year to study Chinese and anthropology. Since then she’s lived in Egypt and China, and earned her master’s in Switzerland. 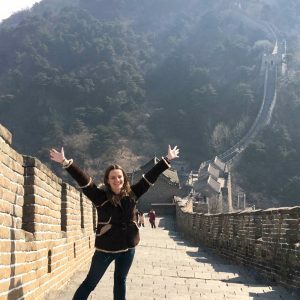 Gianaris has worked as an experiential education instructor for Where There Be Dragons, a Colorado organization that offers gap year and study abroad programs in 19 countries. Students navigate without use of a cell phone. “It gives us a chance to share with them what it’s like to disconnect, to get lost, and to be challenged to talk to strangers,” Gianaris said. That has gotten easier for her as she learned Chinese, Mandarin, and conversational Arabic on the streets. “I love learning languages, so I work really hard at it,” said Gianaris, who came home this year to regroup. She is working with World Relief in Chicago on refugee resettlement programs, and sharing her experiences through photo exhibitions on Instagram.com/kristengianaris. Beth Hollander teaches music in China, and has traveled to five continents and 14 countries. Here she is at the Great Wall of China. After studying in Austria her junior year, Beth Hollander ’15 told her family she’d be staying in the states. That plan changed her senior year when she came across Search Associates, and applied with the international teacher recruiting agency. Eight job offers later, she accepted a one-year internship in Hong Kong. Now she’s teaching music at Peking University Experimental School in Jiaxing, China, where she faced significant obstacles. While Hollander respects the differences and has learned to tolerate a Chinese fascination with photographing Caucasians, there were times she questioned her decision. A year later, she feels differently, in part because she found the love of her life in China. A teacher from the United Kingdom, she met him riding the same bus to work. “We’ve made it through almost a year of culture shock issues, two broken legs—one for each of us—several exciting travel excursions, and language barriers that have strengthened our relationship,” Hollander said. She’s immersed herself in the culture, trying pig skin and duck intestines. She traveled to five continents and 14 countries, including South Korea where she stood in a demilitarized zone. She rode a camel in Morocco, bathed elephants in Thailand, and fed kangaroos and koalas in Australia. After nearly a 40-year career in information technology, Ronald Krbecek pursued a goal he’d had since high school. In February, he moved from Wisconsin to Tanzania, joining the Peace Corps as an agriculture community services volunteer in Tanzania. During the first three months of his 27-month assignment, he lived with a host family to become fully immersed in the language and culture. He works with local agriculture initiatives, training farmers on climate-smart agricultural techniques to improve crop production and food security. Although he was retired and living in Texas, where his four grown children and 11 grandchildren had made their homes, Lawrence Whittet decided there was more for him to do. He moved to 8,000 miles away to Dubai to join a team building the world’s largest solar plant. It was an easy adjustment because of the people involved, he said. More than 30 cultures and countries are involved in the project on the coast of the Persian Gulf. The loyal Redbird fan has had season football and basketball tickets since 1982 and returns for a game every year, even though Chicago is a 15-hour flight. Read more about him. After finishing up a 30-year career in teaching and coaching in Georgia, Tim Como traveled to Europe for the first time to visit an old classmate, who was working at NATO and living in Belgium. When Como returned home, he got a call from the principal of the Brussels American School asking if he’d be interested in teaching. He accepted a job as an instructor of technology, and coaches basketball and football. “My first impression once I arrived was, ‘What was I thinking?’” he said. Being a bit older than most of those who move abroad, it wasn’t an easy transition, but he found people willing to help. Many spoke English and he picked up a little French and Flemish, which are the official languages of Belgium along with German. And then he met Melda from the Philippines, who also arrived in Brussels to work. From nearly opposite sides of the world, they fell in love and married in Denmark in 2013. “Now I have a companion to travel Europe and visit places that I never dreamed of seeing,” he said. After getting his degree in environmental health, Robert Carr felt ready to get his hands dirty working on tough issues around the world. He joined the Peace Corps, working on water supply and sanitation in rural villages in Liberia. That was a long way from the farm where he grew up in Monticello, but it led to a more than 30-year career in international development, working in Iraq, Albania and Tanzania. He is head of strategic planning and monitoring for UNICEF in Tanzania. Carr has improved health and water services in refugee camps in Tanzania, fixed water systems after the Gulf War in Iraq and made sure the poorest corner of Albania had access to social services. “All these efforts threw me into new situations with new challenges. I remain well equipped for this kind of work and am so thankful for the learning environment I had at ISU and the challenges my (environmental health) professors threw at me,” he said. His wife and three children have also experienced his adventures. A son is studying climate change at the University of Amsterdam and his daughter is studying in Madrid. “Sadly, I could not get them to try out ISU, but I did give them a good push in the right direction in the spirit of every good Redbird,” he said. In 2015, Jeff Steffe moved with his family from Chicago to Costa Rica to start a business, Figure 8 Management, and has no return date in mind. He knew Spanish well enough to live in Latin America, but a day doesn’t go by without learning a new word, he said. Not only does he love the sand, sun, jungle and people, the family had no trouble adapting to the “pura vida,” or simple way of life, he said. As a Spanish major, Matt Astle wanted to work on his language skills so he studied abroad his last semester. After graduation, he moved to Spain to teach English and became a translator for a law firm. Not only has he made some of the best friends of his life, and calls Madrid home, “It is a tremendous feeling to realize you are doing something that most people never do,” he said. He also has a new appreciation for the small town of Washington where he grew up. Christine Loconti found a job teaching high school English in Spain through an exchange program. She thought she’d stay a year – it’s been six. She has learned two languages and also writes tourism blogs. The slower pace was a lesson she had to learn quickly, she said. Navigating a new language and a new world was also overwhelming at times. She misses American sports, and packs her suitcase with gum, sriracha and pretzels on visits home, but she’s learned to appreciate what Spain has to offer. In 2012 Gina Panozzo moved to Japan to teach. It was a culture shock, from finding clothing and shoes in her size to how quietly people spoke to dating. On a holiday to Seoul in 2014, she fell in love with Korea, and moved there in 2015. A pleasant surprise was the low cost of health care. A trip to a medical center for stitches and medicine only came to $26. Although she misses her mom, flaming hot Cheetos, and the ease of doing things in a country she knows, living abroad has increased her patience, empathy, and drive to find solutions rather than dwell on problems. It has also broadened her views. “When you live in a different country and culture, you start to questions your own norms and develop new norms that are a mix of the many environments you’ve been in,” she said. Alexandra Wazny earned her degree in special education and taught high school English in Ethiopia for two years with the Peace Corps. She said her effort to respect and embrace Ethiopian culture led to a sense of belonging that surpassed anything she’s experienced in the U.S.
She knew she could give up American food, hot showers, and the internet, but the hardest part was being away from family. Yet she added to her family, meeting a national who became her fiancé. She has returned to the states to teach, pursue a graduate degree, and possibly a future in international education. Read her story. After becoming a CPA, Ashley Carboni found a career with the IFRS Foundation in London, a not-for-profit international organization that develops global accounting standards. Apartment hunting was her first surprise. She was expecting Chicago-like complexes with gyms and big kitchen. Instead, she rented a cramped studio with a dorm-sized fridge. But the fridge is empty most of the time, she said, because she’s exploring or traveling. Describing the work-life balance as “incredible,” she has been to the Sistine Chapel, the top of the Eiffel Tower, and joined a South African safari. When Lydia Wilson arrived in Salamanca, Spain, at 22, she didn’t know the language, culture, or anyone living there. 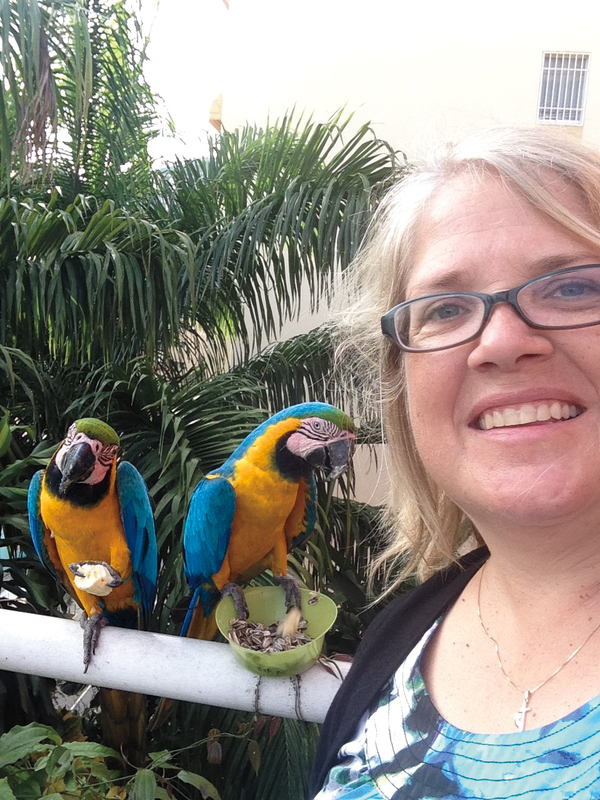 After three years working for a Christian campus ministry, she returned home in June. But she advises anyone considering living abroad to do it. After earning his doctorate in educational administration and foundations, this Catholic priest returned to his native Uganda to build a boarding school for children in poverty. Julius Turyatoranwa’s two older brothers and twin brother sacrificed their education so he could attend school. He was committed to returning to his home and started a nonprofit corporation, Building Hope in Kids—Uganda, in 2017, with the goal of raising $2.8 million for the school. It’s been a slow build, with masons making the bricks and blocks for the school at the site, but construction is progressing with a tentative opening of February 2019. Follow his progress at Facebook.com/buildinghopeinkidsuganda. Before planning your own adventure overseas, consider the advice of alums who have already experienced an international lifestyle. Be patient with yourself during the adjustment period. It’s normal to feel overwhelmed. Leave your expectations at home, and avoid comparisons to life in the U.S.
Be patient with the world and the people in it. There is a lot of kindness everywhere. The rest of the world moves at a slower pace. Adjust. Be open-minded and flexible. Never consider anything weird or strange, because that implies only your experience is normal. You can always go home if it’s not for you. Respect the culture and immerse yourself in it. Try the food. Get involved early. If you stay home and watch Netflix, you’ll miss what you came to experience. Navigating a new language is a challenge. Translation apps help, but pointing works too. Have a stash of your favorite snacks. Little things help you feel connected to home. Don’t drink water out of the faucet. Do your research. Read travel blogs and the country’s recent news. For an easier transition, try Europe. If you want adventure on a budget, check out Asia. One-stop shopping isn’t the norm. You will miss Target, but go with the flow. Get a passport with extra pages because you’ll rack up travel stamps quickly. Expect challenges, like the paperwork of visas and bureaucracy. Don’t let the lack of money be an obstacle. Check out volunteer service organizations and teaching exchange programs. Take lots of pictures, and don’t forget to brag to your friends. You’ll surprise yourself with how brave and resilient you are. Almost everyone misses their new country once they’ve left.